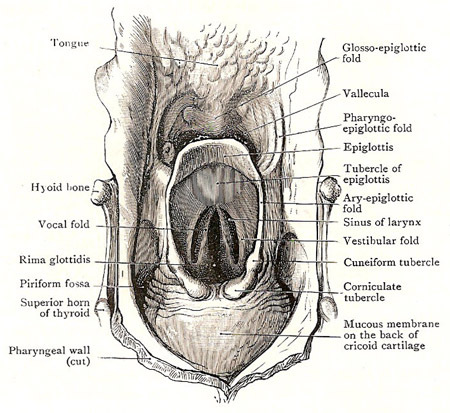 Sagittal section through the nose, mouth, pharynx, and larynx, a liitle to the right of the median plane. Anterior wall of the laryngopharynx. The pharynx is a wide, fibromuscular passageway, commonly called the throat, which extends from the base of the skull to the level of the sixth cervical vertebra. There, behind the lower border of the cricoid cartilage, it becomes continuous with the esophagus. The pharynx serves both the respiratory system and the digestive system by receiving air from the nasal cavity and air, food, and water from the oral cavity. Under ordinary conditions, the pharynx is expanded from side to side and compressed anteroposteriorly (from front to back), so that it has anterior and posterior walls and two borders. Above the level of the inlet of the larynx there is always enough space for the passage of air to the lungs, but below that orifice the anterior and posterior walls are in contact except when separated by the passage of food. The pharynx is widest above, at the base of the skull, behind the orifices of the pharyngotympanic tubes. Thereafter, it narrows to the level of the hyoid bone. It widens again at the level of the upper part of the larynx and then rapidly narrows to its termination. Mucous membrane lines the whole interior of the pharynx and is continuous with the mucous membranes of the cavities that open into the pharynx or out of it. The submucous coat contains a large number of mucous pharyngeal glands. There are also numerous lymph nodules, and in certain places these are aggregated together into large masses known as tonsils. The soft palate extends into the pharynx and divides its cavity into an upper and lower part. The upper part, or nasopharynx, communicates with the nasal cavities by the posterior apertures of the nose, and with the tympanic cavities by the pharyngotympanic tubes. The lower portion of the pharynx is divisible into (1) the oropharynx, or oral part, behind the tongue and behind the mouth, which opens into it; and (2) the laryngopharynx, or laryngeal part, which is behind the larynx, and opens into the larynx and the esophagus. The nasal part of the pharynx, or nasopharynx, is situated immediately behind the nasal cavities and below the body of the sphenoid bone and the basilar part of the occipital bone. It is the widest part of the pharynx. Its walls, except the soft palate, are not capable of movement, and, consequently, its cavity always remains open, and presents under all conditions very much the same form. Its anterior boundary is occupied by the posterior apertures of the nose, through which it opens into the nasal cavities. These apertures are a pair of oblong orifices which slope from the base of the skull downward and forward to the posterior border of the hard palate. Each is about one inch (2.5 cm) long and half an inch (1.25 cm) wide, and it is separated from its fellow by the posterior part of the septum nasi. 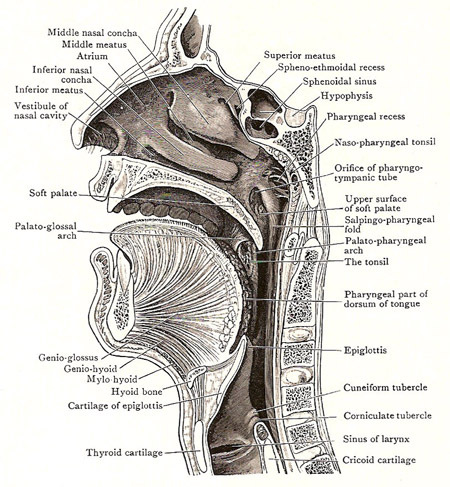 On each side wall of the nasopharynx, there is the orifice of the pharyngotympanic tube, and, behind, it the pharyngeal recess. The pharyngeal orifice of the tube is at the level of the posterior end of the inferior concha of the same side. It is bounded above and behind by a prominent and rounded margin termed the tubal elevation. A fold of mucous membrane, the salpingopharyngeus, and as the fold is traced downward it gradually disappears. The roof and posterior wall of the nasopharynx are not marked off from each other, but form together a continuous curved surface. In the part of the roof which lies between the two pharyngeal recesses there is a collection of lymphoid tissue which constitutes the nasopharyngeal tonsil. Over its surface the mucous membrane is thickened and wrinkled, and in its lower part a small median pit, termed the pharyngeal bursa, is sometimes found. The nasopharyngeal tonsil is distinct, as a rule, only until adult life is reached; in children it is often hypertrophied, forming adenoids which may even block the nasopharynx. The floor of the nasopharynx is the soft palate, and is curved and sloping. Between the posterior border of the soft palate and the posterior wall of the pharynx there is an oblique interval, called the pharyngeal isthmus, through which the nasopharynx communicates with the oropharynx. It is closed during swallowing mainly by the raising of the soft palate against a constricting ridge produced by contraction of the superior constrictor. The side boundary of the pharyngeal isthmus is a prominent fold of mucous membrane called the palatopharyngeal arch. It can easily be seen in a mirror. It begins at the posterior edge of the soft palate and sweeps downward and backward on the side wall of the pharynx, and gradually fades away. It encloses a slip of muscle called the palatopharyngeus, which assists in raising the pharynx during swallowing. The oropharynx lies behind the mouth and tongue. The anterior wall of its lower part is therefore the pharyngeal part of the dorsum of the tongue, which looks more or less directly backward. Immediately behind the tongue is the epiglottis, which belongs to the laryngeal part of the pharynx; but certain parts connected with it belong to the oropharynx. The epiglottis is a leaf-like plate of cartilage, largely enveloped in mucous membrane, and its upper part stands up prominently behind the tongue. The glossoepiglottic fold is a median ridge of mucous membrane between the front of the epiglottis and the back of the tongue; the epiglottic vallecula is the depression on each side of it. The pharyngoepiglottic fold is the ridge of mucous membrane that bounds the vallecula laterally; it extends from the margin of the epiglottis to the side wall of the pharynx at its junction with the tongue. The side wall is the interval between the palatoglossal and palatopharyngeal arches; and it is occupied by the tonsil. The laryngeal part of the pharynx, or laryngopharynx, is behind the larynx, and diminishes rapidly in width from above downward. Its posterior wall and side walls are covered with smooth mucous membrane. Its anterior wall is at the back of the larynx, and parts to be noted are (1) the inlet of the larynx and its boundaries; (2) a piriform fossa on each side of the inlet; and (3) the mucous membrane on the back of the arytenoid and cricoid cartilages below the inlet. The inlet of the larynx is a large, oblique opening bounded above and in front by the epiglottis, on each side by the aryepiglottic fold of mucous membrane, and posteroinferiorly by the interarytenoid fold of mucous membrane. Each aryepiglottic fold is a sharp, wide fold that extends downward and backward from the margin of the epiglottis to the arytenoid cartilage. It contains the aryepiglottic muscle; and, near its lower end, it contains two small pieces of cartilage which produce two little eminences – an upper or anterior cuneiform tubercle and a lower corniculate tubercle. The arytenoid cartilages are a pair of three-sided cartilages placed on the upper border of the lamina of the cricoid cartilage. The interarytenoid fold of mucous membrane passes between them; it forms the lower boundary of the inlet, and encloses the arytenoid muscles, which pass from the back of one arytenoid cartilage to the back of the other. The piriform fossa is the fairly deep hollow bounded medially by the arytenoid cartilage and the aryepiglottic fold, and laterally by the mucous membrane that clothes the posterior part of the thyroid cartilage and thyrohyoid membrane. It is of practical importance because foreign bodies may lodge in it, and, if sharp-pointed, may stick in its walls. Below the level of the inlet, the mucous membrane of the anterior wall of the pharynx clothes the muscles that cover the backs of the arytenoid and posterior cricoarytenoid muscles – and is in contact with the posterior wall except when food is passing. The esophageal opening is the narrowest part of the pharynx, and is opposite the lower border of the cricoid cartilage. The pharynx is part of the gastrointestinal tract, lying between the mouth and the esophagus. 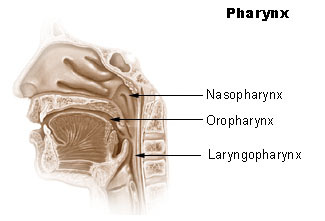 The oropharynx is the first region food enters when it is swallowed. The opening from the oral cavity into the oropharynx is called the fauces. Masses of lymphoid tissue – the palatine tonsils – are near the fauces. The lower region, posterior to the larynx, is the laryngopharynx, or hypopharynx. The laryngopharynx opens into both the esophagus and the larynx.